A Cypher System campaign of Victorian horror? High fantasy? Espionage? Galaxy-spanning space opera? Soon, any of those will be as easy as running The Strange or Numenera. 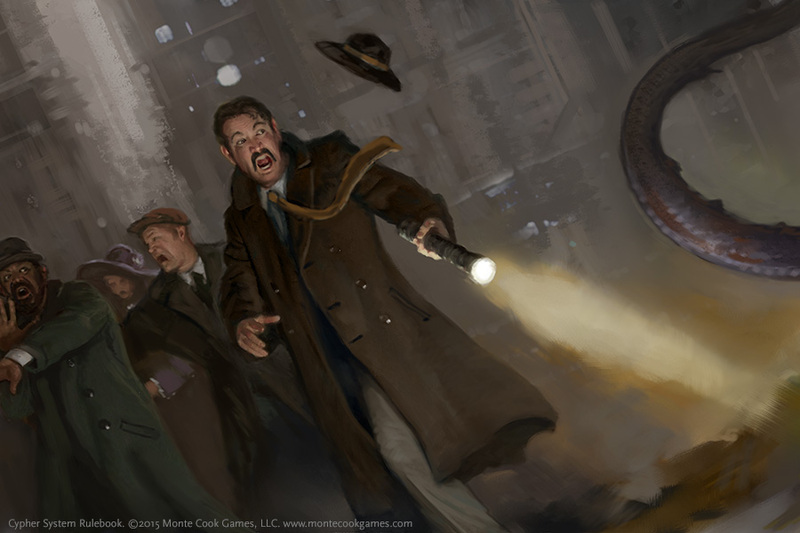 The Cypher System Rulebook is the next big corebook release from Monte Cook Games. It’s coming in early August—but you can pre-order it now (and there’s a pretty good deal–read on)! 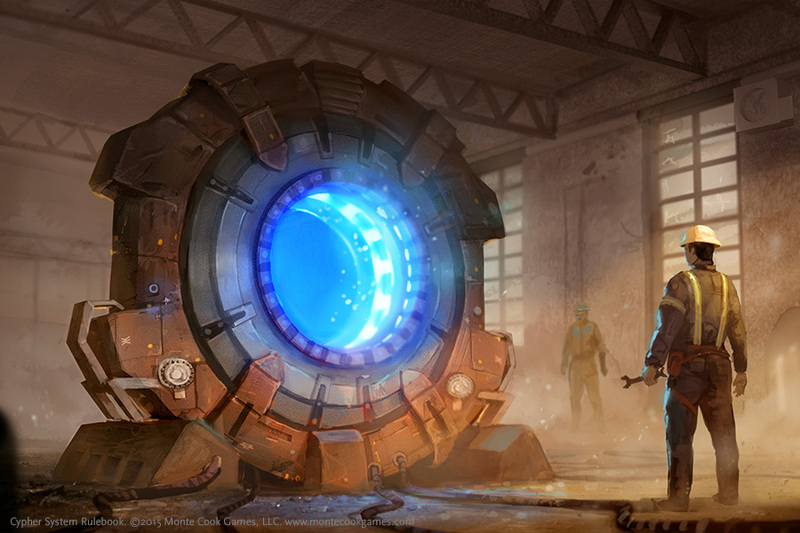 The Cypher System is the game engine that drives both Numenera and The Strange. Both games have been quite popular, winning accolades, awards, and the praise of GMs and players around the world, based on both their unique settings and the rules behind them. So it’s not surprising that over the past couple of years we’ve had a lot of questions along the lines of, “When are you going to release a superhero RPG?” or a science fiction RPG, or a medieval fantasy RPG, and so on. After publishing Numenera and The Strange, we knew the Cypher System was flexible enough to drive virtually any genre of RPG. But while we could make a dozen games based on the Cypher System, what we’d rather do is give you the tools you need to play the games you want! Doing that should be easy, right? We’d just need to grab all the rules from The Strange and Numenera, two completely finished games, and just cram it all into one book. No problem. But that wouldn’t do justice to what we’d like to see. The way both games handle character types, for example, is entirely idiosyncratic to those settings. You can’t take a Numenera nano and plop her down in any genre. And if you tried to make the type fit more into a fantasy setting, it wouldn’t fit into a science fiction one. Oh, and superheroes—those throw a big wrench into things. So clearly this book needed to go way beyond the bounds of what was already designed for our existing games. Monte and our creative team have come up with scores of new descriptors and foci to make different genres work, along with four new character types. We’ve added dozens of new creatures and NPCs. New cyphers. Lots of new rules for handling everything from starship battles to the rising dread of horror. 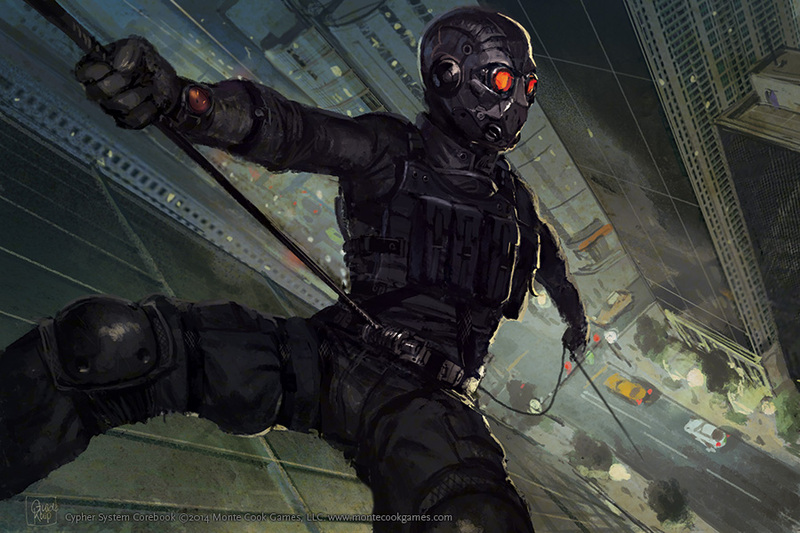 And rules for superheroes—characters who break all the other rules. But there’s also loads for our existing players! If you’re already a fan of Numenera and/or The Strange, you’ll find new descriptors, foci, types, creatures, cyphers, and artifacts you can use in your campaign the minute you crack open the book. And you might want to check out the rules for Insights and many of the optional genre rules as well. There are pages and of pages of content you can make use of in your existing game, even if you never take the Cypher System into another genre! The Cypher System Rulebook will be a 416-page hardcover. That’s the same size as the Numenera and The Strange corebooks, but the Cypher System Rulebook contains no campaign settings, adventures, or other campaign-specific details—it’s all Cypher System! 416 pages of character options, equipment, game rules, special coverage of key genres, creatures, NPCs, and cyphers. 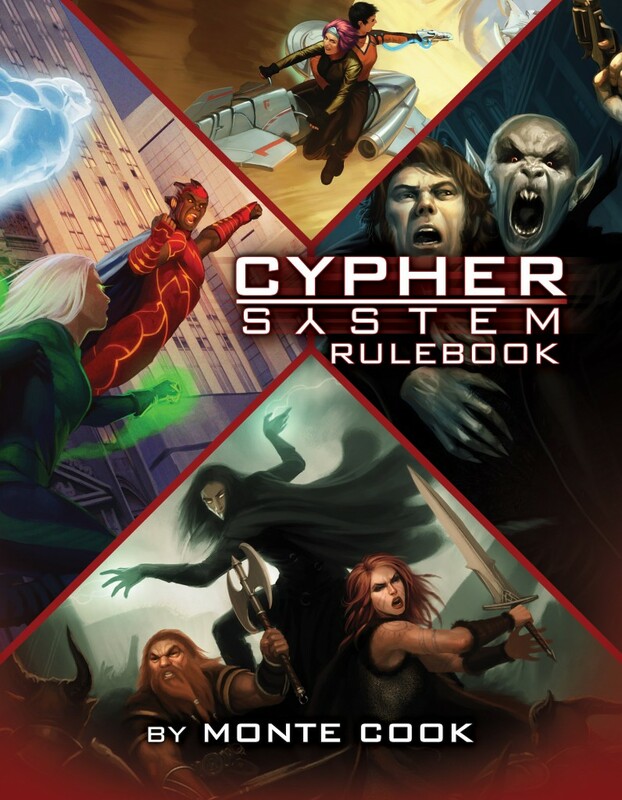 The Cypher System Rulebook launches in early August. 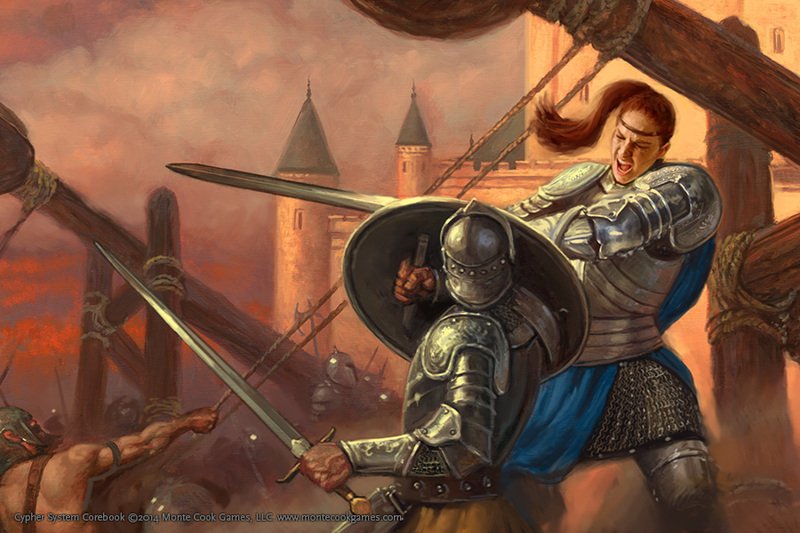 Like all MCG products, it’ll be easy to use, chock full of incredible art and inspirational ideas, and published to the highest production standards in the RPG industry. It’s priced at $59.99 in hardcover and $19.99 in PDF. You can pre-order it starting May 6th, and we’re offering a special deal: If you pre-order your print copy of the game by June 26th, we’ll send give you the book in PDF format as well! Start a new campaign set in a fantasy land of elves and fae creatures, a science fiction setting spanning the galaxy, or a modern slasher horror world—or add scads of new options to your Numenera or The Strange campaign. The Cypher System Rulebook gives you everything you need to run the game you want to play using the critically acclaimed, award-winning, and just plain fun to play Cypher System!